Ioni Sullivan converted to Islam nearly ten years ago. She is British and Muslim and finds no contradiction between the two. Her story, and those of other female converts to Islam, offers a powerful message for Britain today. It’s a message that comes as the murder of Lee Rigby in Woolwich provokes reprisals on Islamic cultural centres, schools and mosques. In the past month communities have sacrificed trust for violence, raising questions about identity and communalism in Britain. This is the context for an important new report, Narratives of Conversion to Islam in Britain: Female Perspectives from the Centre of Islamic Studies at the University of Cambridge. The report synthesises the discussion from three symposia held at the University with fifty female converts to Islam. Narratives of Conversion captures the pressure from Muslims and Non-Muslims to define conversion to Islam in conflict with British culture. But, most vividly for me, it shows how converts to Islam overcome this dichotomy. The report reveals the simplicity and artificiality of the ‘sides’ British / Muslim and defines conversion by its continuity and the sharing of core values from faith and culture. There is evidence to suggest that some Muslims in Britain see British culture as antithetical to Islam. Coming from this background and converting to Islam presents converts with the challenge of acceptance among heritage Muslims: not as Muslims, but as ‘British Muslims’. Converts to Islam are expected to practice their faith in other cultural forms and deny that Islam so comfortably develops the ethical and cultural values from their upbringing in Britain. The participants narrate how they are seen as coming to Islam without a cultural heritage by the Muslim community. “The positive aspects of the convert’s culture are”, the report says, “derided and expected to be discarded”. In marriage especially husbands and their families expect women to practice Islam in their own cultural mould. One participant reflected in an interview with me how her first marriage ended because she was living the life of “a Moroccan village woman from the 70s”. Having lived her life in cosmopolitan cities in Western Europe she was expected to give up her job and avoid talking to men. The popular idea of conversion to Islam as rupture is also evident in the perception among heritage Muslims of female converts as “trophies”. The women in the report complain of being “paraded in a tokenistic fashion”, serving as a self-validation for a community that feels under threat and under-valued by mainstream society. Afro-Caribbean participants, without the social cachet of White women in Britain felt their conversions went “unacknowledged” and “uncelebrated” by the heritage Muslim community. The white woman becomes a trophy because she appears to uphold the value of Islam at the expense of her cultural background; underlying this attitude is the dichotomy of being British and Muslim. Of course there is enormous diversity within the British Muslim community. Narratives of Conversion doesn’t shy away from the challenges faced by female converts in heritage Muslim communities, but it does recognise the tolerance and support of many Muslims. One participant converted to Islam from Christianity after 27 years of marriage. Her Muslim husband cherished her Christian faith, even bringing home Christmas trees every year when they lived in North Africa. Prejudice suffered by Muslims in Britain reinforces the notion of rupture in women’s conversion to Islam. This is reflected in the social costs of wearing the hijab. For Ioni Sullivan things became more complicated with her friends and family when she decided to wear the hijab four years after her conversion. She lamented that wearing the hijab had become “such a politicised, over-emotional, over-signifying step” in Britain. Converts to Islam have faced harassment and even lost their jobs after wearing the hijab. The prejudice faced by female converts creates a division between an acceptable British identity and an unacceptable Muslim identity. A similar view of conversion is found in the media. Narratives of Conversion states that the media share and reinforce the apparent truism that the female convert “used to be British, but now she’s Muslim”. Coverage ranges from benign bemusement to shock and consternation, especially around White, middle-class female converts to Islam. Take, for instance, The Times’ coverage of the launch of Narratives of Conversion. The lot of the female convert becomes a linear story of arranged marriage, domestic abuse and kidnap, with some hope in the future among the converts’ children. Yet when I read the report, I found hope in the participants whose lives and values challenge the false binaries about conversion to Islam in Britain. Much more than a ‘bridge’ between Muslims and non-Muslims – after all, bridges are trampled upon – the women reflect the fluidity of an identity that can’t be fixed or frozen, as many people would like to believe. Both British and Muslim, female converts, according to Project Leader Professor Yasir Suleiman, “challenge our mental and social taxonomies, being insiders/outsiders and intimate strangers at one and the same time”. Conversion for the participants was not defined by abrupt change or rejection of their upbringing but continuity and a “widening sense of self”. In the first few years of her conversion one participant felt like she had a “dual existence”, juggling her identity as a convert among Muslims and the person she’d been prior to conversion with her friends and family, “awkwardly” trying to incorporate her new beliefs into her life. But she overcame this. 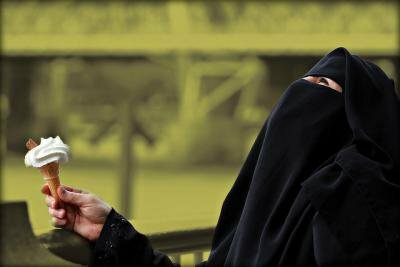 Important values from women’s non-Muslim backgrounds help inform their practice of Islam. Rather than “visiting friends, listening to music and getting ‘stoned’” one participant mused, she was “visiting friends and making dhikr”, a recitation of prayer that can include singing, dance and trance. Female converts also find themselves better able to empathise with the rights of homosexuals than the majority of heritage Muslims in Britain. Having grown up in communities and families that were more tolerant generally of homosexuality, the participants defined their relationship as one of dignity and respect, if not acceptance. Of course conversion to Islam leads to huge lifestyle changes. Some converts found their friendship groups changed when they were no longer willing to go to pubs or have boyfriends. Conversion is accompanied by changes in values. Participants discussed their fresh engagement with feminism through an Islamic re-working that led to a sharper understanding of the inequalities between men and women in Britain and their perception of the over-sexualisation of society. But none of the converts would recognise rejection as a primary factor in conversion. Converts are diverse and their experiences differ widely. Creating space for female converts to be Muslim with their own identity is not to hold them up as bearers of an ‘authentic’ British Islam but to argue that it’s easy to be both British and Muslim. As the focus of divisive tendencies, the spirit of female converts is an important reminder of an identity that shares British and Muslim values and a powerful challenge to those in Britain who deny it.